Videos to help Grade 1 students learn how to analyze and describe embedded numbers (to 10) using 5-groups and number bonds. Visually recognizing (perceptually subitizing) sets of objects, particularly fingers, allows students to move toward seeing two sets of objects together (conceptually subitizing). How do you show numbers on your math fingers? What is the Math Way? 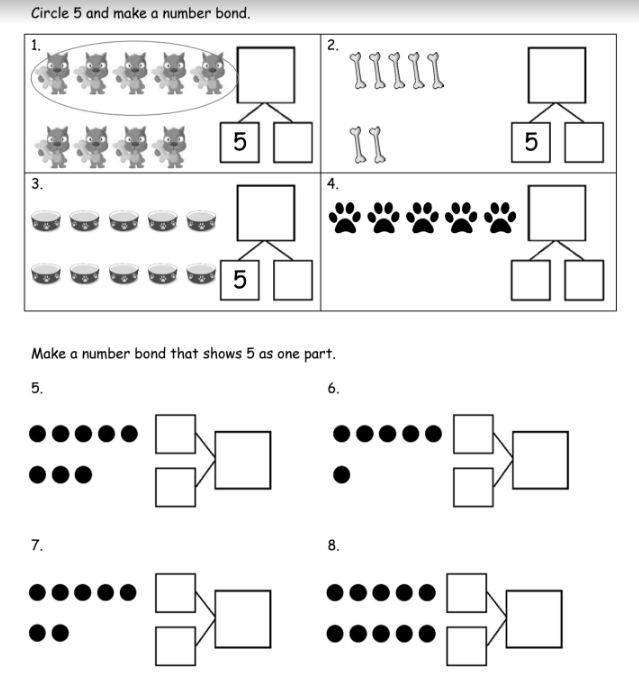 How can we use Math Fingers with Number Bonds? Why are Math Fingers important? Math Fingers and Tally Marks? How do you fill in and complete a Number Bond? What does a number bond consist of? What do the boxes in a Number Bond represent? Why are Number Bonds important? How do you write an addition number sentence from a Number Bond? Circle 5 and make a number bond. Make a number bond for the pictures that shows 5 as one part. Make a number bond for the dominoes. Circle 5 and count. Then make a number bond.